All over. Hope for Levante in their fight against relegation - despite defeat. 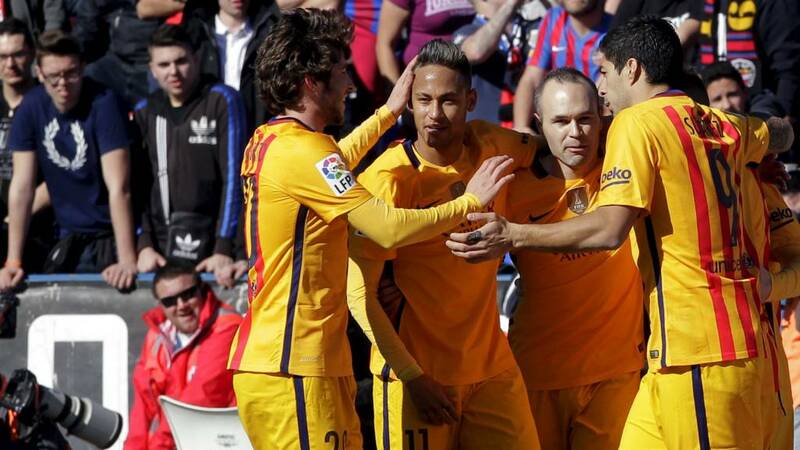 Barca produce a scrappy performance but march on. They are now three points clear at the top of La Liga with one game in hand. This was their 11th straight league and cup win, while they have equalled the Spanish record of 28 unbeaten games in Luis Enrique's 100th match in charge. Many thanks for your company. Barcelona save their best for last as Luis Suarez nets his 36th goal of the season with a composed finish following Lionel Messi's lay-off. The points are in the bag despite an under-par display. This is ending with both teams conceding a string of free-kicks. Seven yellow cards in total. Dirty game? Not at all. Ten shots each for Levante and Barca - three on target for both. The all important stat Levante trail their opponents on is the goal count. Barca are moments away from going three points clear at the top of the table. Of course, Barca are entitled to a rare off day after such a wonderful season. However, Luis Enrique will be anxious his side return to normal service with the business end of the season on the horizon. A ridiculous tug of Neymar's shirt by Ivan Lopez as the Barca forward burst inside the Levante half. Free-kick and a yellow card.- the sixth of the match. Barca's next game is Valencia at the Nou Camp on Wednesday in the second leg of the Copa del Rey semi-final. Will Luis Enrique give Lionel Messi, Neymar and Luis Suarez a night off after a lacklustre display? The Barca boss is very animated on the touchline with just under 10 minutes of normal time remaining. Final change for Levante - midfielder Verza is off and Colombian winger Mauricio Cuero is on. They're going down fighting. At this stage on Wednesday Barcelona were 5-0 up against Valencia. Levante can be proud of their efforts - a performance full of character to give them hope of staying up. I bet Luis Enrique wishes he could make more than three changes after a rare lacklustre display. Here's another Barca change - defender Dani Alves is replaced by midfielder Aleix Vidal. Three against three...Neymar, Suarez and Messi are on the charge. Still Barca can't get a shot away, very sluggish by the leaders. Into the last 20 minutes and changes for both teams. Barca's first substitution sees midfielder Sergio Busquets come on to replace Ivan Rakitic before a double change for Levante - forward Nabil Ghilas on for David Navarro and Victor Camarasa for Deyverson. The yellow card count continues is rising. After Navarro is cautioned for dragging back Messi, Barca's Dani Alves is shown a yellow for a foul on midfielder Jose Luis Morales. Then Jefferson Lerma receives the fifth player to have his name taken. Just under half an hour remaining and still Levante have had more shots than Barca - it's 9-8 but the visitors continue to boss possession. Luis Suarez heads against a post after getting on the end of a curling free-kick...it wouldn't have counted as an off side flag is raised. Corner to Barcelona and from it Ivan Rakitic forces a wonderful reaction save from Diego Marino. Television replays show the Levante stopper did ever so well to keep that out from close range. The Ciutat de Valencia is by no means the biggest ground in Spain but there's a terrific atmosphere being whipped up by the 20,000-plus home fans, who will be hugely encouraged by what they are seeing. Levante are refusing to roll over and are giving Barca a real battle. Lionel Messi has the ball in the net again but for the second time this game it is ruled out for offside. There may have been a question mark about the first being wiped out but there was no disputing this one.